My dad, George Edwin Farrar, was born September 3, 1921. He was the fifth child and second son of Carroll Johnson and Raleigh May George Farrar. Carroll was born December 17, 1888 in Charlotte Court House, Virginia. Raleigh was a native Atlantan, growing up in the Grant Park area of Atlanta. She was born January 25, 1890. Carroll and Raleigh were married in Atlanta on June 25, 1909. Over the next twenty-eight years, they would have nine children. According to the 1920 census (the year before my dad was born), the Farrar family rented a home at 125 W. Boulevard Drive in Atlanta, DeKalb County, Georgia. This area of Atlanta is commonly known as Kirkwood. Carroll Sr. was 31 and was employed as a printer for a printing company. Raleigh was 29. Four of the Farrar children were born by 1920: Geraldine (age 9), Janet (age 7), Carroll, Jr. (age 3), and Dorothy (a month shy of 1). The family had been living in the house at 125 W. Boulevard since 1919 according to city directories. Backing up briefly into the previous decade, the family lived at a number of different addresses. In 1913, the family lived at 1 Edwin Place in Atlanta and Carroll Sr. was employed as a printer for the Atlanta Journal newspaper. Carroll and Raleigh must have liked the name “Edwin.” By then they had two daughters (Geraldine and Janet). The first boy came along in 1916, and they named him after his father. They had to wait several more years before having another boy and named him George Edwin, George after his mother’s maiden name, and perhaps Edwin from Edwin Place as his middle name. Although he was known as George in his military service and later in his professional life to his customers, he was always known as Ed to family. The family continued to move around quite a bit in the 1920’s, always choosing to stay in Atlanta’s Kirkwood neighborhood. From 1921 to 1925, the Farrar family lived at 31 Clay St., SE. Annual city directories list the address as 31 Clay K. I don’t know what the “K” stood for, but perhaps it was an apartment number. Carroll Sr.’s occupation was continually listed as “printer,” but from 1924 to 1926, his place of employment was reported as Farrar Printing Co. By 1926, their residence had changed to 107 W. Boulevard Drive. 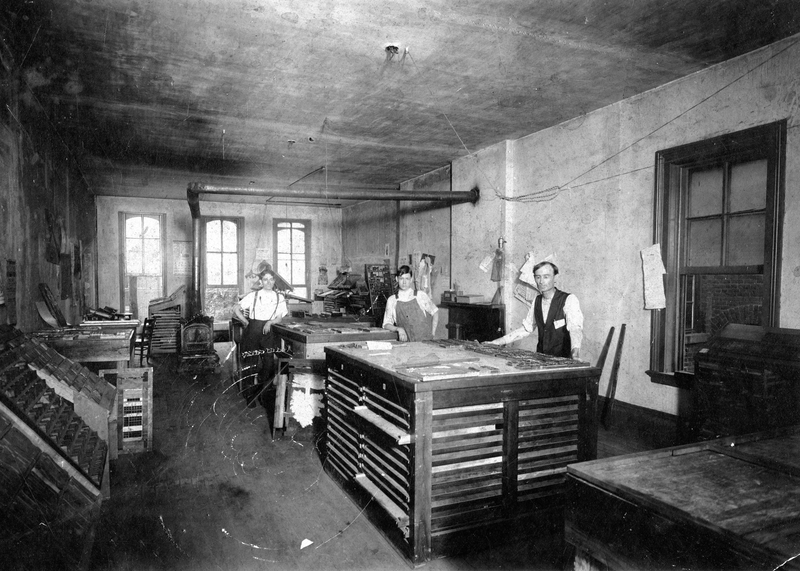 Carroll Johnson Farrar, Sr.’s print shop. I’m not sure, but I think he is the one on the left, standing the furthest back. In 1927, the Atlanta city directory reported the Farrar family living at 1732 (107) Boulevard Dr., NE. Perhaps because of a move in 1927, both street numbers were included. In any case in the 1927 to 1929 city directories, Carroll, Sr. was reported to be working for Ben Franklin Press in Atlanta. He was listed as a printer for the company in 1927 and 1928, and listed as a superintendent in 1929. According to the 1930 census, the Farrar family continued to reside in the rented home at 1732 Boulevard Drive, NE in Atlanta, DeKalb County, Georgia. At the time, Carroll Farrar, Sr. was listed as a printer for a publishing company. Carroll Sr. was 41 years old and Raleigh was 40. By now the family had grown to seven children and all seven lived at home: Geraldine (19), Janet (17), Carroll Jr. (13), Dorothy (11), my dad, Edwin (8), Robert (5), and Martha (2). The only child working was Geraldine, who was a saleswoman for a dry goods store. (Note: part of Boulevard Drive has since been renamed, so this address may now be 1732 Hosea L. Williams Drive). The Farrar family continued to reside at the 1732 Boulevard Dr., NE home into the first half of the 1930’s. City directories place them there in 1934 and 1935. Carroll, Sr. is listed as a printer in both years, but his place of employment is noted as the Darby Printing Co. in 1935. I have not found a city directory listing for 1936, but by 1937, Carroll Farrar, Sr. was a compositor for Lyon-Young Printing. The family lived at 79 East Lake Terrace, SE. The new home was one mile from the 1732 Boulevard Dr. home. The youngest child of the Farrar family, Beverly, was the only one born in the East Lake Terrace home. Beverly remembers that the family rented the home first and then Raleigh decided they should buy it. Carroll, Sr., objected to the purchase, but Raleigh succeeded in talking him into buying the home. I don’t know what year they made the purchase, but they had done so by 1940. They are also listed at the same address in the 1938 city directory and Carroll, Sr. is listed as a printer, with no indication of employer. According to the 1940 census, the Farrar family owned their home at 79 East Lake Terrace, SE in Atlanta, DeKalb County, Georgia. 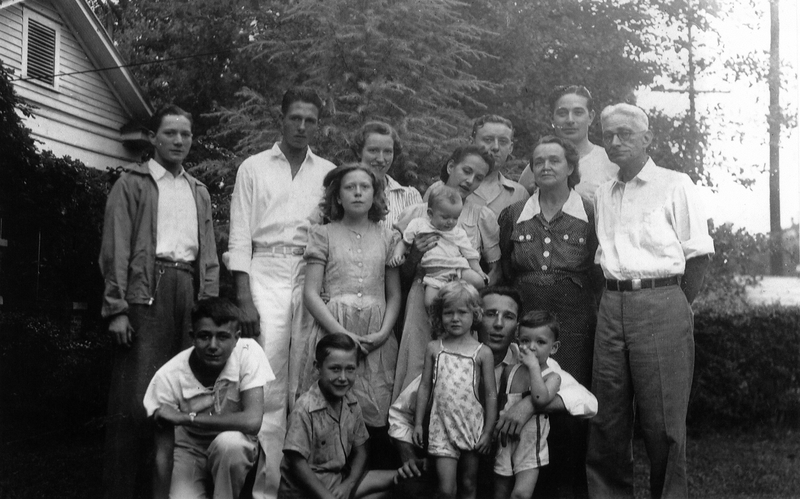 Two more children had been born in the 1930’s, Gene and Beverly, and the family now had nine children. The three oldest girls – Geraldine, Janet, and Dorothy – were no longer living at home, but six of the Farrar children were. Living in the home in 1940 were Carroll Sr. (51), Raleigh (50), Carroll Jr. (24), Edwin (18), Robert (15), Martha (12), Gene (9), and Beverly (3). Carroll Sr. worked as a printer in a printing shop, Carroll Jr. worked as a floor salesman in a department store (Atlanta’s downtown Rich’s store), and Edwin was a soda clerk in a drug store. Standing, back row, L to R: Ed, Bob Hunt (Janet’s first husband), Janet, Ozzie Couch (family friend), Carroll Jr. Standing, middle, L to R: Martha, Dorothy (Dot) holding her daughter Phyllis, Raleigh, Carroll Sr.
My dad lived in quite a few different homes growing up in the Kirkwood section of Atlanta and considered himself one of the “Kirkwood Boys.” One of his earliest memories that he shared with me was that when he was five or six years old, the family moved right across the street from the home they had been living in. He remembered sitting on the front steps of the new house, crying that he wanted to go home. Another of my dad’s favorite memories of growing up in Kirkwood was that when he was a teenager of driving age, he and his fellow friends, the Kirkwood Boys, liked to drive their cars to the top of Stone Mountain. At the time, Stone Mountain was not a park. Picture in the 1930’s a carload of teenage boys, probably some beer, and a giant piece of granite to be conquered. My dad left high school after the 10th grade. He was a good math student and won many math competitions, but with so many brothers and sisters at home to feed, the family needed an extra paycheck and his education was over. After his stint as a soda jerk, he worked as a vending machine maintenance man and made extra money as a Golden Gloves boxer. He continued to live in Kirkwood with his family at the 79 East Lake Terrace home until he enlisted in the Army Air Corps on June 4, 1942. 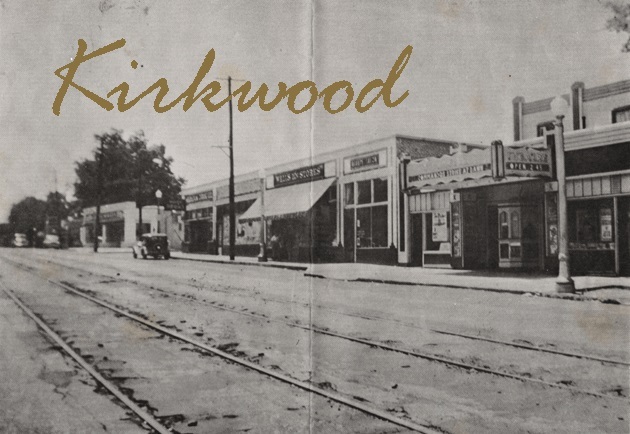 Kirkwood area of Atlanta, Georgia in the 1930’s. Photo credit: The Sarrett family of Kirkwood. By thearrowheadclub in George Edwin (Ed) on April 19, 2017 .